ESOTERIC RECORDINGS are pleased to announce the release of a newly remastered and expanded edition of the classic album "PERILOUS JOURNEY” by GORDON GILTRAP. For over forty years Gordon has enjoyed the well-deserved reputation as one of Britain’s greatest guitar players. He made his first recordings in the 1960s as folk artist, but by 1976 he had crossed into the Progressive Rock genre and signed to the newly formed Electric Records imprint. His second album for Electric was arguably his most famous. 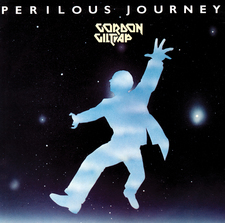 Released in 1977, "PERILOUS JOURNEY” was the second part of the trilogy of releases that began with the “VISIONARY” album (LCVP114CD) in 1976. The album charted and was included in The Sunday Times 20 Best Albums of 1977. Heartsong was released as a single, received massive airplay and reached the top twenty. It was also used, for seven years, by BBC Television as the theme tune to their popular Holiday programme and was nominated for an Ivor Novello Award. "PERILOUS JOURNEY” saw Gordon backed by Simon Phillips on drums, John G Perry on bass, two members of The Average White Band, a brass section including Henry Lowther, Molly Duncan and Roger Ball and with Gordon's superb acoustic and electric guitar work “PERILOUS JOURNEY” featured many outstanding tracks and picked up superb reviews. This Esoteric Recordings edition is newly remastered from the original tapes and includes four bonus tracks. The extras this time include a fully orchestral version of Quest, the original demo of Heartsong and a twenty-one minute compilation of the demo tracks, with Giltrap calling out the chord changes - something any guitarist will find useful if trying to learn these pieces, plus the single Oh Well. 1977 Electric Label LP - TRIX4 Lyric sheet with LP. Slightly different cover picture. Tracks 1 - 9 as listed above. 1977 Electric Label MC - ZCTRX4Tracks 1 - 9 as listed above but in alternate order. 1999 La Cooka Ratcha / Voiceprint LCVP113CD Tracks 1 -9 as listed above plus 3 bonus tracks.